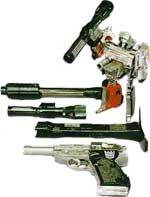 Megatron combines brute strength, military cunning, ruthlessness and terror. Aches to return to Cybertron to conquest after destroying all Autobots on earth. Plans to possess all Earth resources. Incredibly powerful and intelligent. Fires nuclear- charged fusion cannon. Can link up interdimensionally to a black hole and draw antimatter from it for use as a weapon. No known weakness. "Strike when the enemy isn't looking." Skywarp is the sneakiest of all Decepticons. Enjoys playing cruel pranks on fellow Decepticons and appearing out of nowhere to attack Autobots. Not too smart. Would be useless without Megatron's supervision. Top speed of 1500mph. Can instantly teleport up to 2.5 miles. Carries heat-seeking missiles and variable-calibre machine guns. "Cries and screams are music to my ears." It is said Soundwave can hear a fly sneeze. Uses anything he hears for blackmail to advance his status. Opportunist. Despised by all other Decepticons. Sensors can detect even lowest energy radio transmissions. Able to read minds by monitoring electrical brain impulses. Acts as radio link for others. 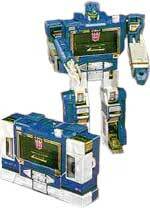 Locates and identifies Autobots, then informs Decepticons. Carries a concussion blaster gun. Often target of retaliation by his comrades. "Conquest is made of the ashes of one's enemies." Seeks to replace Megatron as leader. Ruthless, cold-blooded, cruel... considers himself the most sophisticated and handsome of Decepticons. Believes Decepticons should rely more on guile and speed rather than brute force to defeat Autobots. Fastest flyer of group, can reach Mach 2.8 and an altitude of 52 miles. Shoots cluster bombs and null-rays which disrupts the flow of electricity. Very good at what he does, but sometimes overrates himself. "The deadliest weapon is terror." Contemptuous of anything that cannot fly. Not totally convinced of the Decepticons' cause, but they persuaded him to continue battling Autobots. Flies at speeds up to 1500 mph... produces controlled, deafening sonic booms that can be heard for 200 miles. Equipped with powerful drone rockets and incendiary gun. Doubts about cause sometimes impede effectiveness.